Although the study area for the SSE extends east to Markham Road, that option did not make the cut. 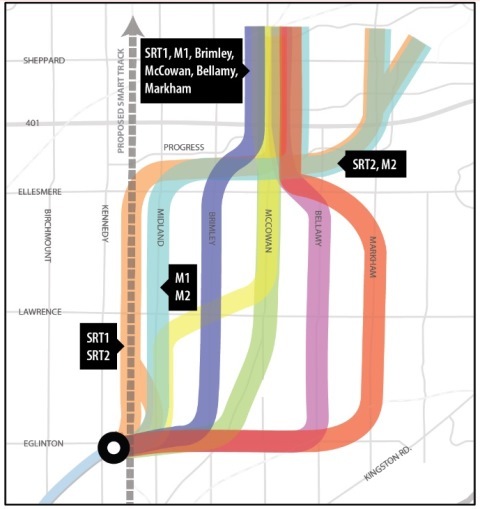 An obvious reason is that this takes the line too far out of the way adding substantially to the cost and to the travel time from Sheppard and STC down to Kennedy Station. Cost premiums of $600m and $1b have been suggested for the Bellamy and Markham Road alignments respectively. Why go further east? The problem lies in Mayor Tory’s Smart Track plan in the GO corridor now shared with the SRT. If Smart Track provides frequent convenient service and, like the SRT, is part of the TTC fare system, then it will draw many riders from the SSE, riders who were used to justify the switch from LRT to subway technology in the first place. If the line is further east, advocates hope that it will draw its own demand by intercepting riders first. However, another part of the demand model concerns riders arriving from the north who contributed to the bump in demand estimates for the subway. These riders would come from the very north edge of Toronto and from Markham where any service in the GO corridor will be much more attractive than taking a bus south to a Sheppard/McCowan Station, let alone to STC if the subway is shortened as a cost-saving measure. The Bellamy route is an odd choice because it runs through a low density area which shows no sign of imminent development. Midland is equally odd because it is closer to SmartTrack even than the McCowan route. Both are compromises that are attractive only if one accepts premises that are as much about politics as planning. Bellamy moves the line further east at a comparatively modest cost (“only” another $600m), and may improve the SSE/ST ridership split a bit. This route also has a connection to GO’s Lake Shore East service at Eglinton Station, although the geometry of the location could make this tricky. How many GO customers would opt to ride to midtown via the subway rather than staying on their train to Union is worth investigation lest this connection be played up for more than it might actually deliver. Midland is a variant on the scheme advanced by former Transportation Minister Glen Murray for the subway to follow the SRT corridor. That idea would have required a complete replacement of Kennedy Station and a multi-year shutdown. This is a face-saving alternative to retain the spirit of Murray’s proposal. The existence of this report and its availability to the media raises serious questions about the context of the TTC presentation. At the very moment the TTC Board was told that the shortlist had not been finalized, not only had this been done but the information was in Councillors’ hands. Estimates for subway projects run agound on the variety of factors that can affect costs including inflation, topography, geology, utilities and operational plans. The Council approval was based on an estimated cost to complete the project of $3.56-billion including inflation. Costs would be shared between Ottawa (19%), Queen’s Park (56%) and Toronto (26%). Any further cost is to Toronto’s account, and this makes the selection of options and features that could drive up the cost an important issue for Council. 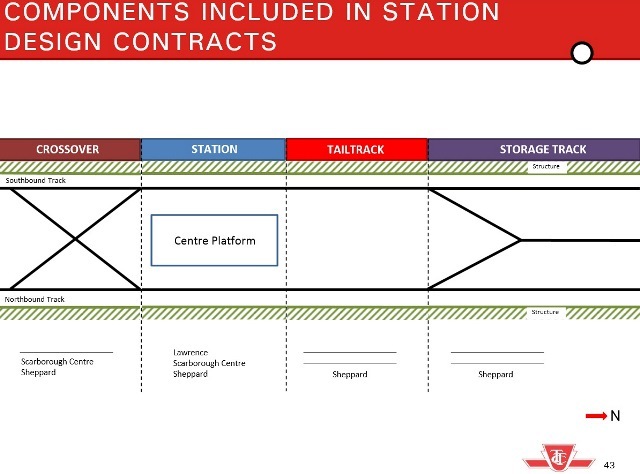 The scheme as approved would be 7.6km long with three stations at Lawrence East, STC and Sheppard East using a fleet of seven trains (enough to operate every second train beyond Kennedy Station to Sheppard). Construction would begin in 2018 with completion in late 2023. 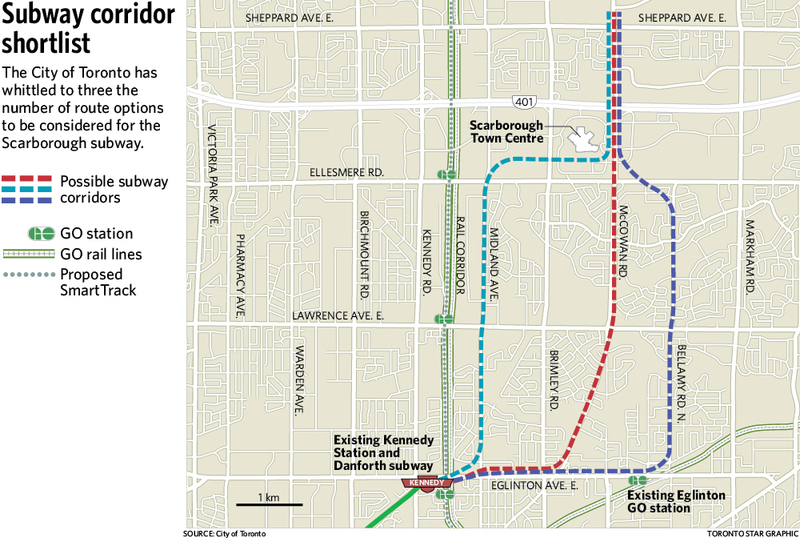 Already there have been suggestions that a fourth station should be added at Brimley and Eglinton. The estimated unit costs for construction are $180m/km plus about $200m/station. These are 2015 dollars and are subject to inflation. To put these numbers in context, the Spadina extension to Vaughan is 8.6km long, and has 6 stations. That is $1.548b worth of running structure plus $1.2b worth of stations, plus ten trains at a cost of about $160m, for a total of roughly $3b. The actual budget for the extension is $2.6b reflecting the fact that some work was done in years past. In any event, the uninflated unit costs are in the ballpark. Things could easily get out of control if, for example, Councillors demand architectural monuments for their stations, or if the route is substantially extended. Lawrence at $160m. This is a line station that would have no provision for parking. No turnback crossover structure would be provided. STC at $200m. This station would include parking and a crossover. Sheppard at $500m. This station would not be just a terminal, but would have tail tracks and storage tracks to provide an overnight home for the expanded fleet. Note that this cost will apply to whatever station becomes the terminal because the storage facility has to go somewhere. 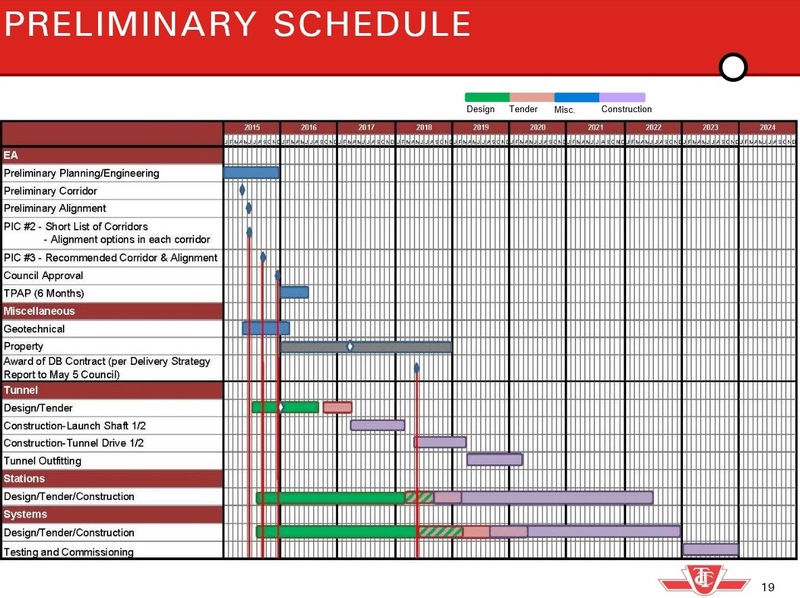 The TTC had planned to undertake public consultation through the summer despite the fact that (as described in the presentation), the shortlisted corridors were still not known. Conversely, a final recommended alignment is supposed to come before Council in Fall 2015 as part of the larger package of studies on Smart Track, GO and the Downtown Relief Line. Up to 2016: Project startup, staffing, etc. Preliminary engineering and Transit Project Assessment. 2016 to 2018: Property acquisition and design. This schedule was described as very optimistic and it could be affected by factors such as unexpected conditions or substantial increase in scope (length, stations). Another factor that could complicate the process could be the extra time needed to design, tender and negotiate some form of P3 arrangement for project delivery. However, that mechanism is a prerequisite for federal funding, and is much beloved of Queen’s Park through its Infrastructure Ontario arm. The City and TTC would have to come up with a significant justification to avoid going the P3 route especially with the history of the Spadina project and the sense that somehow this could have been avoided with private sector expertise and some degree of “risk transfer” to a private partner. When challenged on the speed at which the project appears to be building up steam, CEO Andy Byford replied that Council has directed the TTC to build a subway, and barring any change in that direction, he is proceeding to do this as quickly as possible. The consulting contracts that have been let so far (or are pending) are to be paid based on work actually done within an upset limit, and they have escape clauses should the TTC need to change plans based on political shifts. Council will face the combined effects of any cost increases in the SSE, the potential bill for other transit projects, and major non-transit work such as the need to rebuild Toronto Community Housing stock, not to mention budgetary pressures in the 2016 cycle. This will all hit Council in Fall 2015. Steve – I am glad you asked the question, especially given the previous talk with regards the appropriateness of Robert’s comments. My problem is that with a couple of exceptions, and these due to concerns of viability – I find the first broad swipe makes a certain degree of sense. From the Big Move section 5.0 Looking forward. I agree with the vast majority – except the Yonge Extension as far as Richmond Hill, and that largely because I would deeply concerned with this being simply too far – run it to Steeles, and build LRT starting there, if you can create enough parallel capacity. The other the Vaughan subway extension – but well that ship has sailed, but I would have supported a shorter subway and LRT, and behind the scenes I strongly suspect so did the professional planners. These I believe would also be the 2 projects were the most politically infected right out of the gate. The rest is of course suitably vague in certain areas, but well the broad strokes are likely reasonably close. Steve: Were you planning to say something, or just leave this drivel as is? I think the citizens of Budapest should be offended. Actually I intended to ask what world his Scarborough was in but I was using a different computer and thought I was hitting a carriage return at the end of the line but instead I entered the comment. I discovered on a trip to Europe two years ago that Eastern Europe, i.e. the former Iron Curtain countries, were cultural gems waiting to be explored. Budapest is one of the most beautiful cities that I have visited. The only problem with these cities were the stretches of dull bland concrete buildings built during the communist era. I, too, must agree with Scarborough Boy’s comments about comparing Scarborough to an unknown place like Budapest. In keeping with Scarborough Boy’s feelings about Scarborough I would urge all commenters to compare it with world class cities that are more in tune with his belief in Scarborough’s true place in the world. I would suggest that other commenters refer to places like Chortling, England; Wurlitzer, Germany; and Dacron, Ohio when they wish to compare Scarborough to other world cities. I have to concede, that it is not really that clear exactly what is truly on the table (as opposed to political illusion). What is likely to get pushed onto or off of said, at any given moment. I can read the Metrolinx official position, and wonder what portion of the “Next Wave” stuff is really on the table, I can even wonder what portion of the current “Big Move” stuff is really on the table, especially when I consider the delay on the Sheppard LRT, and how easily the plan for LRT on SRT was changed. When I consider that we do not have a route for the subway, and that the “Next Wave” project list relates so loosely with other discussion from the government, it really does beg the question – what is plan A) vs B) vs C)? If we do finally pick a route for subway – what will be the cap for spending, and what would be the LRT alternative that would really be on offer. I personally favor – simply taking the pot of money on offer for Scarborough Transit at this juncture (based on the last council vote), and have city planning try to create the best plan for Scarborough, with the money specified. The direction to city planning would be something to the effect of: You have 3.8 billion, to spend in Scarborough on transit infrastructure, devise a plan that will require a similar increase in subsidy to operate as the subway extension would have, that offers the best mix of substantial service improvement to the most riders, attracting new riders, and supporting new development where we want it. I suspect this would result in a very complete, mixed mode plan that would greatly improve the rides across the vast majority of Scarborough. I would also ask city planning to specify the high priority projects that would follow these, and what the impact of these would be. I suspect the result would be much better transit, a much more attractive place to live, and enhanced development, and a tax base that grew more quickly. However, this would require actually listening to somebody who knows how to plan, not how to sway voters. It would make for good governance, but boring elections. Metrolinx is supposed to be working on an updated “Big Move”. At some point, Queen’s Park will have to take a position on what’s in, what’s out, because that document won’t be published without political input/edits. Malcolm it’s refreshing to read yours posts that describe the real problem instead of taking Political catch phrases & pointing the fingers at Citizens who are forces to pick and choose the best of these inefficient/incomplete plans. The Liberals, Conservatives, McGuinty, Ford & Miller are all to blame for this mess. To throw out insults, constantly bash & generalize a large area of people with differing needs is truly sad. Do they even know what LRT plan is on the table, or only what they read/heard in election literature? You don’t seem to appreciate the Metro Toronto crowd to be referred to “political elites” but throwing insults in the other direction is acceptable? Should we associate people in all Countries, Provinces/States & Cities by their political leaders & their silly slogans? A couple patchwork LRT lines that serve only select portions don’t appeal to the majority of people out here for many reasons & makes it an easy target Politically for another silly plan. Overall It’s really that simple. The plan missed the mark on multiple levels & no reasonable solution has been offered aside from improving the craptacular SLRT with a subway on a better route. I guess Scarborough will just have to take the subway & the insults that come along with it. Steve: I think this thread has been done to death. No further comments, please, as I will delete them. In the last week or so the Toronto Star published a reasonably long look back at Fred Gardiner, after whom the Gardiner Expressway was named. Apparently a pushy guy who was a big fan of expressways. I wondered what Toronto would look like if, instead of starting to building downtown expressways, those funds had been spent on rapid transit. Did Toronto ever need a Gardiner, a DVP? If we did then why don’t we need one now? Steve: First off, Toronto is a very different place from the days when Gardiner pushed through his expressway projects. In those days, the only subway ended at Eglinton and Yonge, and a great deal of what is now “inner suburbs” like Scarborough was farmland. The waterfront was industrial, and there were no romantic notions that valleys should be left in something like their natural state. Gardiner’s attitude to the Don Valley is that God made it so Toronto would have someplace to put the DVP. Need is very much a question of alternatives. The section of the Gardiner under discussion is not as heavily used as the DVP nor as the western part of the Gardiner itself. Growth of demand into downtown for decades has all been by transit. Roads could not possibly handle the volume of commuting into the core area. With the change of the waterfront from a dumpy faded industrial town to a major residential and commercial neighbourhood, that land isn’t quite as “free” as it once was. Imagine trying to build the Gardiner from scratch today. Sorry Steve if I might – broad comment that is not particularly related to the Scarborough subway – but rather transit as a whole. Joe, my problem in not having voters take ultimate responsibility is, that these people won office, and devised plans to attract votes. If the voters met the candidate at the door with a steady refrain of -“how about we let the planners plan” this would stop. We – as voters need to have enough understanding to know when we are being sold something that is raw politics. The problem in the end is that we the voters, keep voting for, or supporting what excites us, not what makes sense – ie Steve’s pony in the living room. The best planning is that which you barely notice, where the pieces just fit. Change that truly works usually comes a little at a time. We need to look for base hits not home runs. The Ontario LRT explosion (Ottawa, Kitchener/Waterloo, Mississauga/Brampton, Eglinton Crosstown, Finch West, Sheppard East, and now Hamilton) means a lot of LRT projects are funded and/or under construction. None of the LRTs under construction (Ottawa, Kitchener/Waterloo, Eglinton Crosstown) have yet opened. The first one will start service in either 2017 or 2018, and finally introduce Ontarioans to what modern, European-style LRT is really like. Ironically, Calgary in oil-happy Alberta was there first — with C-Trains — and it has been a great success there. Over there, they aren’t your everyday slow TTC non-traffic-prioritized streetcars — but rather, more competitive in transit performance and convenience to a subway. We can only hope that the first modern Ontario LRT finally opens, that LRT will be recognized as a high performance transit option unlike a streetcar stuck in Queen Street peak traffic, and Scarborough will reconsider. I suggest an expense-paid trip (in VIA Business Class, or GO Train to Kitchener) to either Ottawa or Kitchener/Waterloo once the first LRT opens, just so every Scarborough city councillor can witness what a modern LRT is like — before a contract is signed regarding the subway. Hang on a few dozen more months. It’s called bad planning. Period. It’s unfair, unattractive, & inconvenient. I agree 100%. However, the bad planning was building the Sheppard subway as a subway in the first place. There isn’t anything reasonable that we can do about that. Spending nearly a billion to turn the existing subway into an LRT is almost as crazy as extending that unnecessary subway when we could build two or three times as much LRT at the same cost. This isn’t something unique to Scarborough. Obviously, in retrospect, Dundas West should have been built on the east side of Dundas, and Main on the south side of Bloor, to make connections to the respective GO (and now UPX) lines viable. But nobody in their right minds is suggesting we spend hundreds of millions to relocate those stations. We maybe build a tunnel and make the best of it, and otherwise spend that money somewhere else where it can do more good. Steve: Actually the east end of Dundas West Station is practically under Bloor GO Station. It is very easy (once Metrolinx “convinces” the owner of The Crossways building) to put in a direct connection between the two. As for Main, getting the Danforth subway that far south would have required quite a swing south and then back north again to be on trajectory for Vic Park. I believe this potential connection is highly overrated. It looks nice on a map for people who only see the city at the scale of their video monitor. It that easy to change the system huh? I agree with the problem but it’s not up to Scarborough citizens to fix the system that has been corrupted & broken for hundreds of years. Yet when it’s Scarborough’s turn to receive transit everyone tries to go cheap and integrate the system poorly. I guess when you don’t have the Political power of a newspaper & media corporation behind you or the lobbying power of a Richmond Hill you have to [fight] tooth and nail hard to get a system that even integrates with existing infrastructure otherwise accept the cheapest patch work options being offered. Actually the east end of Dundas West Station is practically under Bloor GO Station. It is very easy (once Metrolinx “convinces” the owner of The Crossways building) to put in a direct connection between the two. Sure, but in a perfect world, wouldn’t we have the main station building on the east side to easily connect from the streetcars and buses without having to walk all the way through the train platform? Don’t get me wrong, I’m not complaining about how “arduous” this connection would (will?) be, just saying in a fantasy world it could be better. Just like the proposed Sheppard subway/LRT connection – it’s not perfect, but it’s not outrageous, either. Steve: Actually there’s a good reason Dundas West is on the west side of the street. The old Vincent Loop was rather small on the east side, and the TTC/City didn’t own all of the property back to the rail corridor. Meanwhile on the west, they had to take all of the property west to Keele Station because of the six-track section consisting of the two mainline tracks and the four track storage yard (“Vincent Yard” although nobody uses that name these days). The structure for Vincent yard extends back into Dundas West Station and it can be entered via doors part way down the stairways into the station from the mezzanine. With all of that surface land to play with, and the need to support multiple routes, it made perfect sense to put the loop on the west side. Don’t forget that GO Transit did not exist when the station was designed and built. As for Main, getting the Danforth subway that far south would have required quite a swing south and then back north again to be on trajectory for Vic Park. I believe this potential connection is highly overrated. It looks nice on a map for people who only see the city at the scale of their video monitor. I agree with this (or really I guess I defer to your better informed opinion), and I wasn’t trying to suggest Main should be located under Danforth GO station, just that if the station was on the south side of Danforth instead of the north, it would be slightly closer and avoid dealing with crossing Danforth. I also realize I accidentally called it Bloor and not Danforth initially. My point was really just that if you want to pick at nits, you can find them all over the system, it’s not just a “Scarborough gets screwed” thing. Steve: But equally trying to judge decisions taken a half century ago by today’s city is rather short sighted. We still have people who refuse to believe the number of 100K as the growth rate for the GTHA, nor who accept that for downtown Toronto, the car maxed out its usefulness for peak capacity decades ago. The suburban dream dies hard especially when transit does such a bad job in those areas. 1. The area around Danforth GO was dominated by a railway yard and various industries. 2. Main station replaced Main Loop which was also the terminus of the Carlton car. 3. And again, GO transit only started operating in May 1967 as a three year experiment along the Lakeshore line with the subway extension to Warden opening a year later. While the subway was under construction, the Province was wondering if GO Transit would be a failure. Honestly Joe, Easy??!!!! This is the hardest transformation of all !!. The notion that we are responsible as voters, requires us to take personal responsibility. Let us be honest with ourselves!! – as long as we hire, and fire people based showing consistent preference for the transparent but pretty lie, to the hard truth – we should reasonably expect to be lied to, and or get half baked plans, that look good to just enough people to get elected. If you are talking LRT period then Edmonton beat out Calgary by 3 years, April 22, 1978 versus May 25, 1981. Granted Calgary’s system is more extensive and has street ROWs but Edmonton started the LRT revival in Canada and North America. But equally trying to judge decisions taken a half century ago by today’s city is rather short sighted. We still have people who refuse to believe the number of 100K as the growth rate for the GTHA, nor who accept that for downtown Toronto, the car maxed out its usefulness for peak capacity decades ago. The suburban dream dies hard especially when transit does such a bad job in those areas. I completely agree. There are reasons for all these things; the location of Dundas West and Main, the transfer at Kennedy and the SRT route, the existence of the Sheppard subway, and many others. Some of those maybe should have been foreseen, some (like the growth of GO) were probably impossible to predict, and some were necessitated by unavoidable conditions that still exist, but no matter what, they are the way they are now. The legacy of decisions that were made over the past 100 years or more will continue to impact the TTC across the city, just as I’m sure they deal with similar issues in major cities all over the world. It’s the reality of an evolving city. We can yell until we’re blue in the face about “fairness,” or we can accept that things won’t be perfect, do our best to minimize the impact when we have an opportunity, and use our money to build the most efficient and effective system possible. Am I alone is suspecting that the appearance of an alignment via the UP Express spur in presentation materials is a preview of the direction SmartTrack is likely to take? If you haven’t been following Jen Keesmat she’s been showing this map quite a lot in reference to upcoming consultation. Steve: I follow Jen Keesmaat on Twitter, but have not seen this in any of her posts there (I just checked in case I missed it, but it’s not in her recent material). Yes, this looks like a possible compromise. The real issue however is what station it would use at the airport. There are physical limitations on train size with the UPX station, and SmartTrack is going to have bugger all capacity without longer, more frequent trains. It would certainly seem to be a decent combination of political face saving and operationally reasonable for the west end of SmartTrack to amount to a municipal contribution to integrating UP fares, adding some stations and building an extension south of Pearson to the Airport Corporate centre where it can meet the east end of the Mississauga Transitway (along with Eglinton LRT whenever it does happen, saving that project from having to build a new airport access route in the process). It also seems like the kind of project that would open the door to that 427 busway that appeared during the Official Plan Review but never ranked that highly or got much discussion. It’s not ideal by any means, but it does seem to pull together the various threads in the west end in a way that would be workable with the infrastructure we have in Etobicoke, especially in terms of putting track capacity to decent use, threading access routes into the airport and integrating with that London HSR project if it goes ahead. Steve: What is also missing is a reference to the extensions of either the Crosstown or Finch LRT lines to the airport. Without full TTC fare integration and frequent service on the SmartTrack airport service, this really isn’t much of an improvement. I have an uneasy feeling in my gut from the overall gist of the discussion on this thread that the funds for transit expansion within Toronto are very tight. Scarborough must choose between the SSE or LRT, and cannot have both, and somewhere in there in the soup is also the RER, SmartTrack, and the DRL, and therefore, in the end there might be neither SSE nor LRT. 1. Congestion costs the GTHA an estimated $8.0 Billion a year. 2. Toronto council and the public had no qualms adding a special municipal property tax in order to pay for the difference between the fully-funded LRT and the SSE. Together with the tax increase and provincial and federal funds promised, the SSE is fully-funded, as well. Consider also that Torontonians pay far less municipal tax than their neighbours in the 905 area for the same assessment. Consider that the tax base in Toronto is leagues ahead of the 905 area. My own property tax in Peel Region is proof enough to me that I’m paying a lot, lot more. Sure, I get better garbage pickup and nicer roads than Toronto, but public transit here is virtually non-existent (unless you count the ubiquitous school buses). Nobody says “boo” when taxes go up 5% annually. Therefore, I am suggesting that Toronto has the financial clout to pay for a lot more for transit infrastructure. Toronto is considering an option on the Gardiner Expressway which costs $900 million. How about another $ 1.0 billion for subsidised housing and homeless shelters? If Toronto had good leadership and fair taxation, far more could be accomplished! I really think that both of these need to extend to the airport district – to a single mobility hub, that would include GO, the Mississauga BRT, some form of a ZUM, and a service in UPX that ran with high frequency into the core. This is slightly off topic but in many ways it’s the reason Scarborough is in the situation it is. I haven’t seen a party without a half baked funded plan yet at any level. So what’s a voter to do? Vote & debate over crap. I do admire your faith. But we are further than ever from that type of change in this country. Our politicians are controlled & sponsored by major corporate giants & outfits which also own media outlets able to spew their political slant through many different vehicles. They all know the system is weak. So you can’t blame a voter for being misled in their busy lives. I personally think any voter who is passionate to a specific party & has no direct financial tie with the party has been dearly mislead. Voters really only have the power to switch the winning team. Money flows from one set of rich lobbyists to another. If money continues to be the driver to what accelerates our politicians into power we’ll likely never see the honesty or integrity we all dream of. I would love to have the Sheppard LRT extend to the Zoo. What a great trip for the kids! I wouldn’t want to take the bus there — I’d be worried it wouldn’t come afterward and we’d be stuck and have to become one of the exhibits (“stranded TTC passenger”). Maybe they could even re-implement the Zoo monorail as an LRT loop. The Sheppard bus doesn’t go to the zoo on weekdays. You have to swap for the 86 at Morningside. I’ve only done it once but experience on 85+86 to the zoo from Don Mills was good except at the intersection of 404/Sheppard where traffic bunches up at rush. Certainly better than the 86 from Kennedy. I feel that a one stop extension of the Sheppard line past the 404 would make the 85 trip a lot smoother. We just need to remember the reason they need all that money – is to convince us that we want to vote for them. The parties have become massive marketing machines. Electoral reform is required, 1st with power being devolved back to the local MP/MPP/riding association. I agree our party loyalty should be low, and we should be choosing between candidates that were named by the local riding associations, regardless of whether that is blessed by the leader. The power of the center has been rising since the 1970s to the point where the local candidates are seen as a proxy for a vote for leader – this should not be. If people would research their choice, and not rely on advertisement – the system would have a fighting chance. Michael Chong has the right idea – power to the riding, away from the center. Michael, that hasn’t been practical anywhere in the world. Centrally run disciplined parties are simply more effective at winning, and the result is that they will take over riding associations no matter what you try to do. The only reform that works is proportional representation: vote for a party. At least this means that if you don’t like any of them you have a good chance of voting in a brand new party; which is possible now (Wildroese anyone?) but really hard. An extension of the Sheppard subway to Victoria Park, coupled with a BRT and potentially HOV lanes along Sheppard would be much more efficient and effective use of public funds to accommodate growth and transit needs in the area. The Victoria Park extension was already identified as the most viable extension alternative by the IBI Group, and it would generate a lot more value for a lot less money than the alternatives. This is one of the reasons it would require real legislative change, and a real level of involvement from a respectable number of voters. We as voters need to start looking locally, and electing the best member, and then telling them we voted for them – despite their party.